The perfect, traditional Greek lemon potatoes, ideal for your Sunday family roast!!! Crispy on the outside, fluffy on the inside with a delicious lemony flavour.. Greek lemon potatoes are perfect on their own served with some crusted bread to dig into all the delicious juices or accompanying roast lamb, chicken, pork, a juicy burger or steak, and the list goes on. So how to make the perfect Greek lemon potatoes? It is as simple as 1-2-3 – Select the right potato variety, add the secret lemony ingredient and crisp them to perfection! You can parboil them, i.e. cut them up in wedges, boil them in a pan until right before they are ready and then sift using a colander. Then drizzle with some semolina and the lemon sauce. Alternatively you can cut your potatoes up in wedges, dress and bake them straight in the oven. The second approach will take a little longer as the potatoes need to bake for longer but I have found that it gives them crispier edges, while the parboiled version allows for more of the lemon sauce to soak in and tend to be flakier. The secret ingredient for the crispiest Greek lemon potatoes is in the sauce! The special sauce that we will be using to garnish our favorite Greek lemon potatoes is nothing else than a mix of lemon juice, dried oregano, minced garlic and some semolina. Semolina is made from ground up durum wheat and is perfect for making roasting dressings. Semolina will coat the potatoes and will harden up when cooking, forming a nice crispy skin around them and adding to the crunchiness of the maris piper potato. For a large batch of about 7-8 potatoes use 3 garlic cloves, 3/4 of a cup olive oil, equal amount of water (if not parboiled), 1 tsp dried oregano, the juice from 2 lemons and 1 or 2 tsps of semolina, depending on how crispy you like your Greek lemon potatoes! I always make a little extra just in case the potatoes need a little longer to cook and I have to season again mid-cooking. Over the years I have thoroughly enjoyed these lemon roast potatoes with a variety of roasts, like roast lamb, chicken, pork and of course beef and they have been the perfect side dish for my large Sunday family meal. So go ahead, give them a try using the detailed instructions below and bake these authentic, traditional Greek lemon potatoes to perfection! Got a question or comment? Feel free to ask in the comments section below and of course don’t forget to share with your friends on your favorite social network using the buttons above! 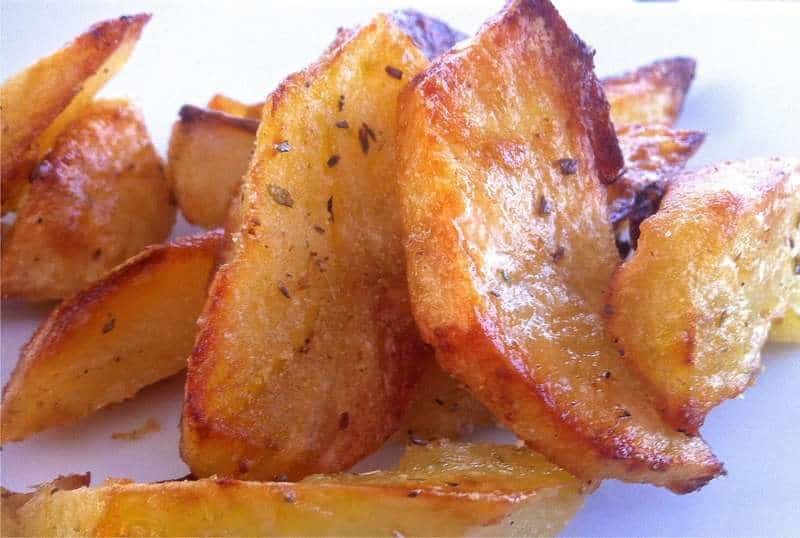 To prepare these extra crispy Greek lemon potatoes, cut the potatoes into wedges and place them on a large metal roasting pan. Into a bowl add the remaining ingredients (including the semolina and the 150ml of water) and blend; pour the semolina-lemon mixture over the potatoes and season well with salt and pepper. We’ve updated the instructions to clarify this point. Thank you for your feedback! Basically mix all the seasoning ingredients including the semolina in a bowl and then pour over the plain peeled and cut potatoes. There are two ways of making them. The traditional Greek recipe does not require the potatoes to be pre-boiled. This will result in crisp potato skins and sharp edges. We have experimented with pre-boiling and using a colander to “flake” them (shake about for a few seconds) and then roasting. That results in flakier potatoes and a different kind of crisp to the crust, more blunt edges and more intense flavor as they absorb more of the oil/sauce. Also cooking time is cut down since the potatoes are pretty much done by the time you put them in the oven. Its a matter of personal preference really, I personally like the clean and sharp look and crispy edges hence I do not pre-boil. Let me know if you try pre-boiling them as I’m keen to hear your thoughts! Hi I want to try this but would like to pre-boil the potatoes first – it’s just no clear how much water I put in the lemon sauce if I do pre-boil them? You’ve just sail3/4 cup of olive oil and equal amount of water (if not pre-boiled) so how much water if it’s boiled? Do you serve these in Asda restaurants ? Minced meat is probably a spelling mistake from our side, its beef mince, but depending on the recipe might be pork. Would you mind posting the link where you found it so I can clarify it? In the US, beef mince is ground beef. Have you had any success with cooking these ahead of time and reheating? Or maybe I should half cook, and then complete near to the necessary time of serving? Unfortunately I don’t think that it will work – roast potatoes are one of those things that you need to eat fresh out of the oven as the oil/sauce will end up soaking in them too much making them soggy. Your best bet if you would like to have them pre-made would be to half bake, cool immediately and finish off closer to the time of serving. Hi there! looks great! Is there anything else I can use instead of Semolina? My hubby is gluten free…. I think there is a misprint in the recipe for Greek lemon potatoes, it say to preheat oven to 200 ? That’s to low, it needs to be at at least 350 or more? Thank you for pointing out! It is 200C, I have added the F measurement (400F). Are the potatoes in a shallow roasting pan in a single layer or are they a couple layers? They are in a single layer, to make sure they are all crispy! Silly question but our “large” potatoes seem to range all over the weight scale…do you have a weight recommendation for the potatoes? Thanks so much. Can’t wait to try these! These look delicious! This is the way my family makes them too, but without the semolina. Now with that trick I can make them even better (don’t tell my Thia). The only thing that would improve this recipe is cooking the potatoes in the pan you just roasted a chicken in, using the chicken juices as part of the liquid. I love this recipe and your whole site – great job! For the lemon potatoes, can I use little nugget potatoes and not peel them? Haven’t tried making them with nugget potatoes, but I am presuming that it will be ok – wash them thoroughly and quarter them then bake with the sauce. As the skin will still be on, the sauce will not penetrate the potatoes as much but should still taste delicious! Thank you for the recipe Eli. Question in the write up you mention “1 tsp” of oregano, but in the ingredients list, it states “1 tbsp”, I’m thinking a tablespoon… with this amount of potatoes. Right? For me semolina + cornmeal. Right? Semolina is not cornmeal even though it has a very similar end result. You can substitute one for the other or use together, even though my recommendation would be just using fine grained semolina only. I make big batches of potatoes similar to this. Par bake and freeze for later. I’ll have to try the semolina tip…. I love crispy edges! You’ll love them with semolina, it adds a very nice crisp to them! Does the water go in the original mixture or is it for later? is the 200C for a standard oven or Fan oven? I used small golden honey potatoes. Halved them and then voiled in microwave for 17 mi. (High). Then drained is sieve and then solutiin added and put into a baking pan and into oven preheated to 400 degrees F.
Baked for approx 12 to 15 minutes. Then i pulled them out, placed them in hot skillet on stove. Splashed with olive oil and turned periodically over med high heat during those 12 to 15 min. Did salt to taste and also added a couple of pimches of semolina. Its the semolima that really pulls the potatoes together for the authentic greek texture and flavor. Btw, i used Real lemon juice approx 1/2 cup. it would be nice if we can print the recipe only. U.S. here. A friend mentioned this recipe on a mutual website and I’m anxious to try it. A Question: If you are looking to use a starchy potato, wouldn’t a Russet (baking) potato, which is a high-starch potato be more in keeping with the recipe than a Yukon Gold, which is a medium-starch and good all-purpose potato? A Russet would provide a nice, fluffy interior. Now I’m off to investigate the rest of your website. Please try to keep in mind that your site isn’t just shown in the UK. Maris Piper potatoes aren’t available or even known about outside of your area. Please give alternatives for “specialized” ingredients. It would save the rest of us alot of time researching just to make a simple recipe & encourage people to return to your site. You’re being very rude to the person sharing this recipe. How about you google “ maris piper substitute.” It should take you about a minute. The recipe recommends Maris Piper “as they are one of the most starchy kind”. So perhaps you could find a starchy variety of potato in whichever country you happen to be. Or failing that perhaps boil your brain as it is clearly as much use as a potato. I’m half Greek and half American Hill Billy. Just learning how to cook “Greek” and love your web site. My mother (the Hill Billy) used to make the most amazing lamb meat balls and lemon potatoes. Nothing I’ve tasted so far has come close to hers but your lamb meatballs sound “right” so do the potatoes. I’ll be cooking them up soon. Thanks for a great web site! Hi there, is it possible to make the sauce and marinate the potatoes overnight but only make before you serve them?